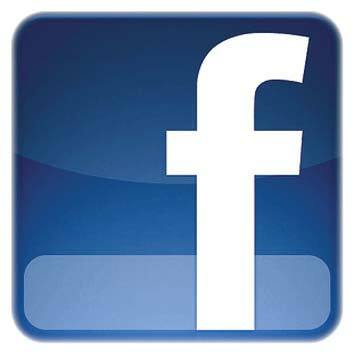 in 1997, initially writing children's stories and short stories aimed at the women's magazine market. in magazines and newspapers, including a commission from the Spectator. She was also successful with short story and poetry competitions and became the Press Officer of the athletic club where she coached and the Dyslexia Institute for whom she worked at that time. Helen then joined the Romantic Novelists Association as an associate member and wrote three full-length romcoms, the third of which passed successfully through their New Writers' Scheme. Majorca. 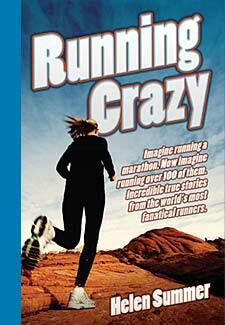 That publisher turned out to be John Blake and it was he who invited Helen to write a book about people who'd run over 100 marathons, giving Helen the chance to combine her love of writing with her life-long love of running. and has sold several thousand copies. 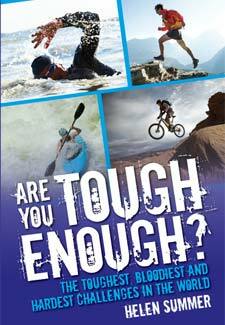 Both books are available through Amazon and from all good book stores. 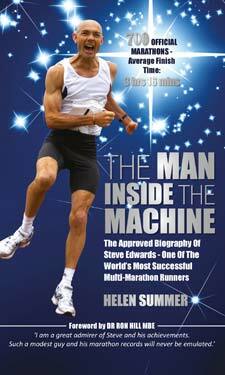 Helen's third book, 'The Man Inside The Machine', came after she'd got to know Steve Edwards, one of the runners featured in 'Running Crazy'. The more she got to know Steve and his wife Teresa, the more Helen realised this was a story that deserved more than a chapter, containing as it did not only incredible world record running performances spun over 30 years, but also physical disability, bullying, a unique medical condition compromising athleticism, personal tragedies and, above all, for frustrated romance writer, Helen, a true love story. Launched on 3rd April 2016, the book sold over 200 copies within the first 10 days! It can be ordered through: seasidehelen@hotmail.co.uk. Helen also writes for several running publications as well as the Food & Drink Guide and gives talks on writing and running, in bookstores, libraries, sports shops and health & running clubs across the country.